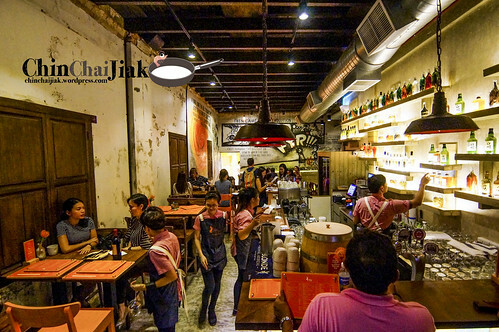 Tanuki Raw, a sister restaurant of Standing Sushi Bar, is situated at level 2 of Orchard Central. 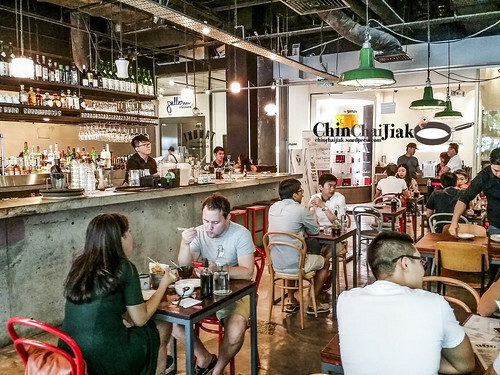 It occupies a cosy corner just behind the escalator and this restaurant offers an indoor and outdoor seating. 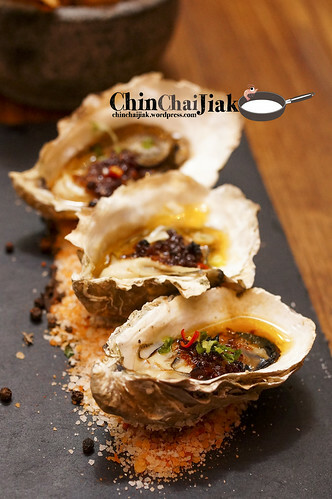 It’s actually an oyster bar that also offers a good selection of Japanese-inspired dishes such as Donburi and Sushi Roll. 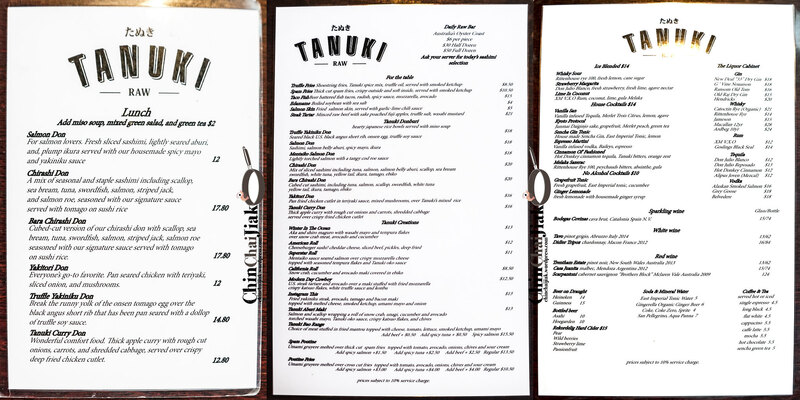 A price of their main course typically ranges from $16 – $20, however Tanuki Raw has a lunch menu which offers the exact item on their menu at a cheaper price. For instance, a Salmon Don that usually cost $18.00++ only cost $12.00++ during lunch. 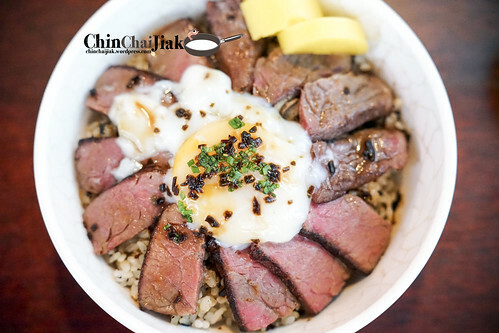 The Yakiniku Truffle Don is the signature rice bowl at Tanuki Raw that consist of Angus Short Rib slices, an onsen egg and a portion of seasoned rice drizzled with truffle soy sauce. This bowl scores a very high score in term of presentation and the taste is too able to match up to the expectation. The tender beef goes very well with the rice that is flavoured with Japanese mixed seasoning as well as the truffle oil. Needless to say, anything with an onsen egg with a soft boiled flowing egg yoke can’t really go wrong. The Yakitori Don doesn’t sounds exactly exciting as it’s commonly found almost everywhere. However, this is actually one of the best that I had. The exterior of the chicken is surprisingly crispy whereas the inside is soft and tender. 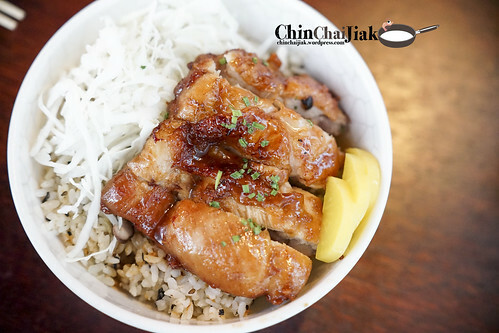 The rice is doused in a good serving of teriyaki sauce and goes very well with the crunchy vegetable. At $12.00++ (lunch menu) for it’s quality, i am quite pleased with this dish. The Salmon Don is also one of the popular choices here. 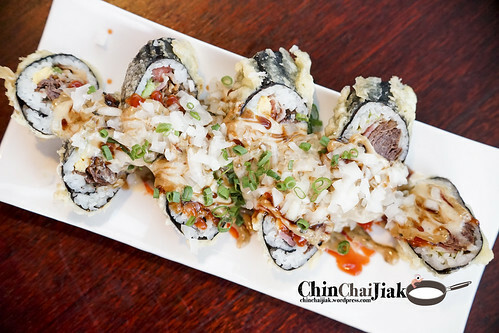 It comes with three kinds of Salmon – sliced raw, cubes in mayonaise and seared. They are rather generous with the portion of salmon and the rice is flavoured as well. This is not a bad choice for Salmon lovers but I do prefer their Yakiniku Beef and Teriyaki Beef over this. 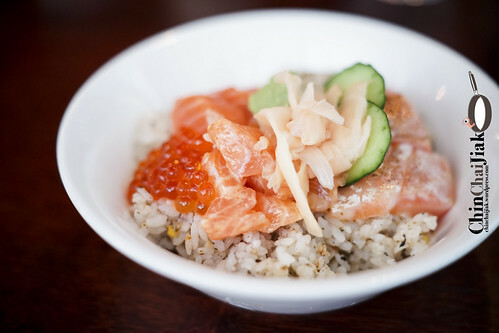 Chirashi Don is gaining popularity as people nowadays are no longer satisfied with just one kind of Salmon sashimi. 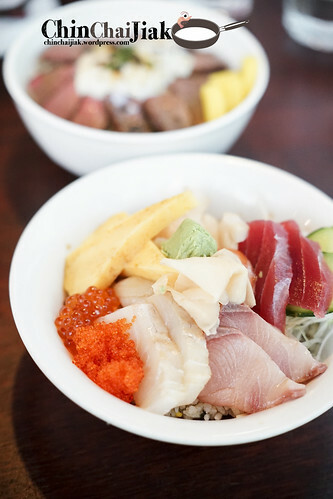 The Chirashi don is served with six kinds of Sashimi, two kinds of Roe and a few slices of Tamago. At $17.80++, i wouldn’t say it’s cheap but with ingredients like Scallop, Sea Bream, Tuna, Salmon, Swordfish and Striped Jack, it’s quite a feast for the price that you are paying. 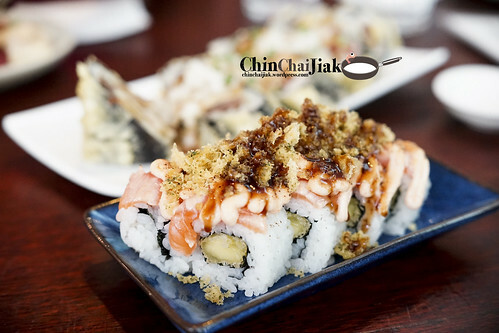 This seared salmon sushi roll is drizzled with savoury mentaiko sauce, topped with mozzarella cheese and tempura flakes. 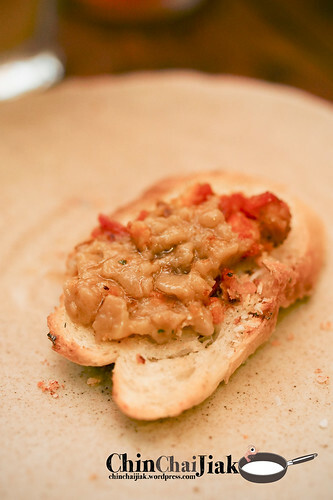 The overall texture is pretty good with a mix of creamy and crispy texture. The seared salmon, as expected, has a smoky fragrance and the melty salmon texture is always the best part of dish . If I compare this with Koh Grill’s Shiok Maki, it’s still a little pale in comparison but for the price of $11++, I think it’s pretty not bad. Yakiniku Steak, Tamago, Bacon, Melted Cheese, Ketchup, Mayo and Chopped Onions all in one roll. Sounds sinfully good isn’t it? Upon taking my first bite, this sushi roll actually tasted like cheese burger. There’s nothing bad to taste like cheese burger actually just that if I like to have cheese burger, likely I will have it at other places. Also the appearance of the roll doesn’t justify the name of “instagram this”. Most of my friends think that it’s ugly. Sad case. 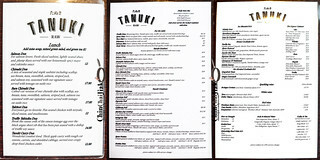 I actually visited Tanuki Raw a couple of times, all during lunch time, before writing about them. Their Donburi is value for money and most of the quality are way above average and my favourite is definitely the Truffle Yakiniku Donburi. I have to highlight that their Yakitori Don is also a worthy mention. I need to highlight that probably due to the seasoning or sauce in the rice, i was quite thirsty after the meal and was gobbling down water. 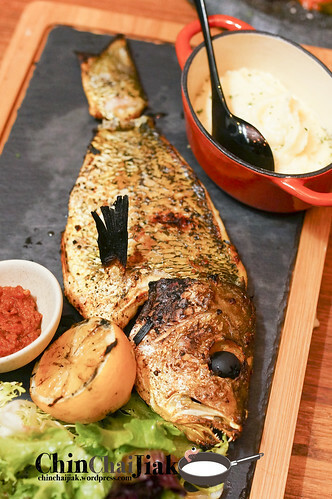 However, Tanuki Raw is definitely the place to visit if you are looking for a comfortable japanese eatery that offers quality Donburi at a reasonable price. 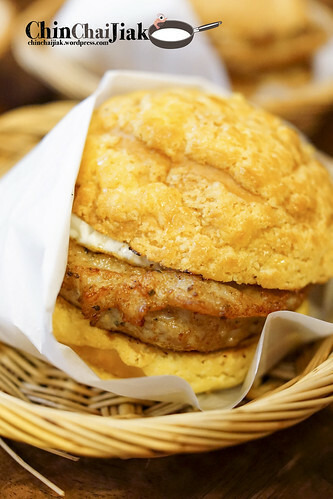 If you have never heard of Tai Lei Loi Kei, they originated from an island, Taipa, in Macau and they are very well known for their pork chop bun. They have a humble beginning when they opened for business at Taipa in year 1960 and started by selling plain Piglet Bun. Back then, business was quite not very ideal, as the ferry is the only mode of transport from the main Macau island. In year 1970, business picked up during and after the construction of the bridge connecting the Taipa to Macau. 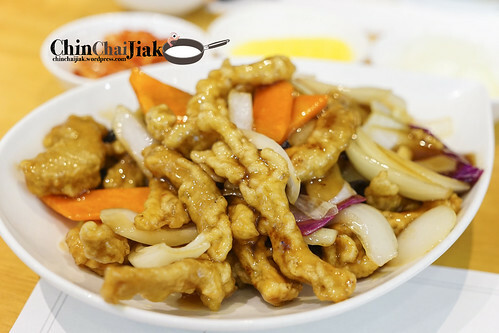 During this time, a local chef suggested to the lady boss then, to consider adding in a slice of pork chop into the bun and also imparted some knowledge on preparing pork chop using Portuguese-style cooking method. The lady boss also consulted various chefs on how to improve her recipe. This is the turning point of Tai Lei Loi Kei and many specially travelled from the main island to Taipa just for their pork chop bun. In Dec 2014, Tai Lei Loi Kei opened it’s first brand in Singapore at Serangoon Nex. 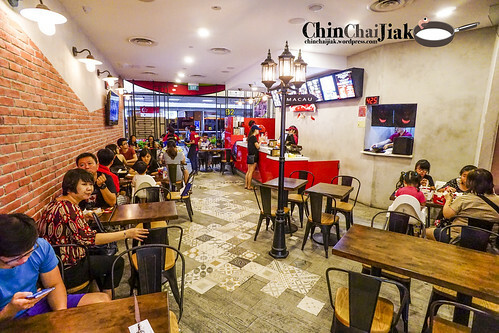 It’s situated at B2 of Serangoon Nex and they have adopted a fast food restaurant operating model. 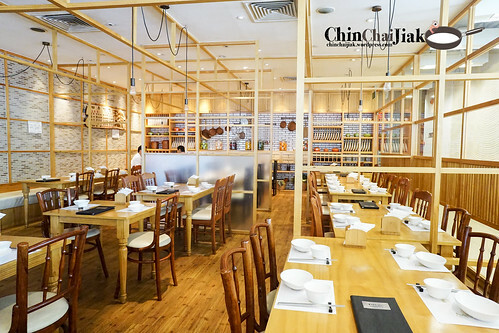 They serve a variety of main courses involving pork chop such as pork chop bun, noodle and rice. 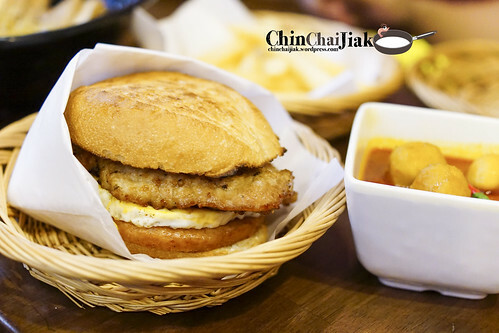 Tai Lei Loi Kei is famous for its pork chop bun and is branded as their must-try dish. I ordered their bun ($6.90) with two add-ons at $1 each for a piece of luncheon meat and an egg. I also topped up $4.00 for a set meal that comes with an ice milk tea and a bowl of curry fish ball. All in all, the meal cost me $12.90. The portion of the pork chop bun is quite well-sized. 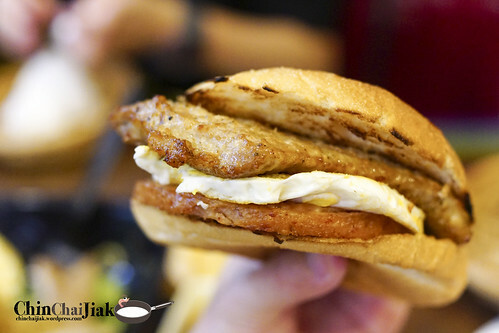 The pork chop is rather thick and is sandwiched between two pieces of well toasted crispy bun. I was actually quite surprise because some reviews online mentioned that the bread is plain average but I thought the bun is pretty good. 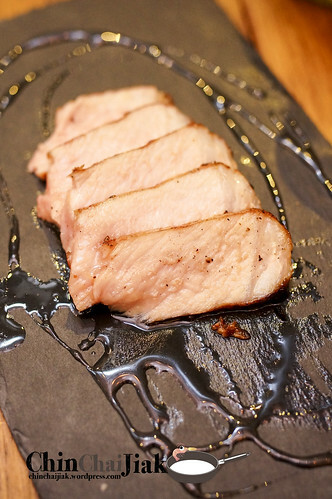 The pork chop has an expectedly tender texture and with a light crisp on the outside. At first bite, it doesn’t taste fantastic but it gets better after each bite. 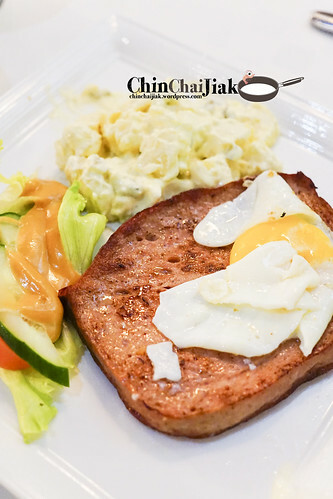 The pork chop is moderately marinated and not overly salty so it’s quite enjoyable to the last bite, especially when it’s served with an add slice of luncheon meat. However, I thought the egg add-on didn’t do the pork chop bun much favour. 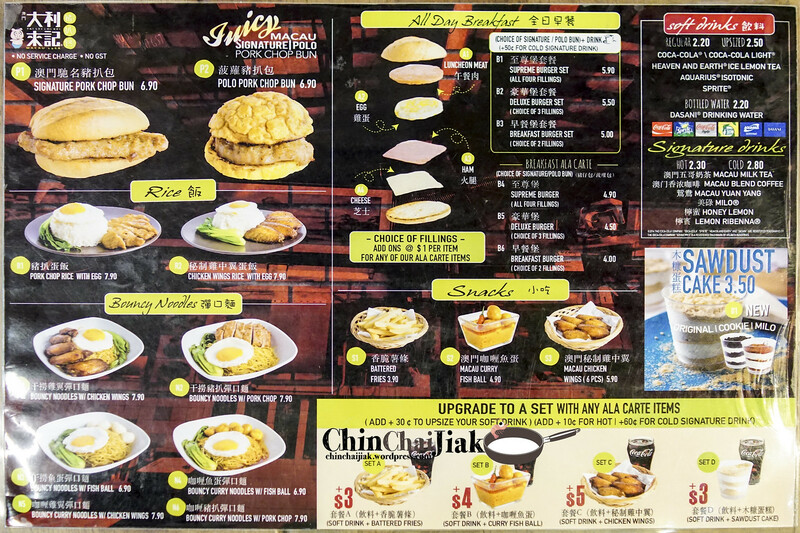 If only they can change the sunny side up to the Chinese Pan-fried Scrambled Egg. 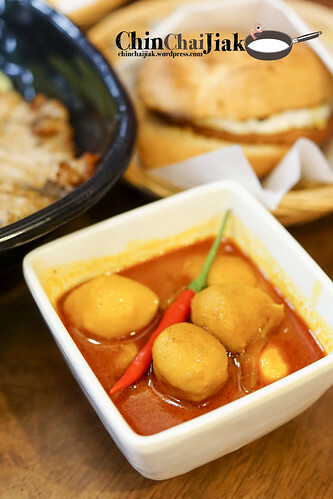 The curry fish ball actually taste quite different from those that i had in Hong Kong. The curry is definitely sweeter, although it’s not necessary bad. 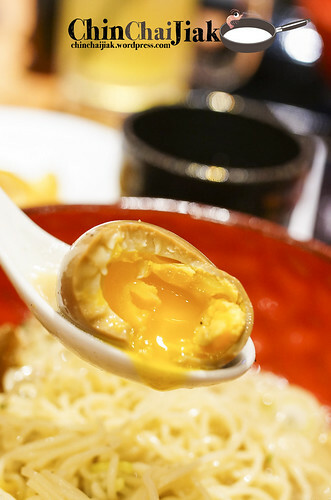 The texture is an in-between of Singapore’s bouncy fish ball and Hong Kong’s chewy version. Overall I think this is not fantastic, but not bad either and i manage to finish the fish ball with no difficulty. The pork chop taste exactly like the one in the pork chop bun so I am not going to write about it again. As for the noodle, it’s quite disappointing. I was expecting the noodle to be more flavourful but it’s quite bland, with only a tinge of fragrance of the spices found in the Chinese Braised Sauce. I didn’t manage to finish the noodle. $6.90 for a pork chop bun (a pork chop and bun and nothing else) is not exactly affordable considering it’s a fast food dining environment. I could have a full meal in most fast food chains in Singapore. In term of taste, i think this pork chop bun is pretty not bad in term of Singapore standard and indeed it’s one of the better one around. You can pay a visit to Tai Lei Loi Kei If you don’t mind paying abit more for a branded and a rather satisfying pork chop bun. If you compare this to the some that i had in Hong Kong, Tai Lei Loi Kei’s pork chop bun stood out for it’s size and satisfaction but loses out for it’s value for money and to a certain extend, taste. 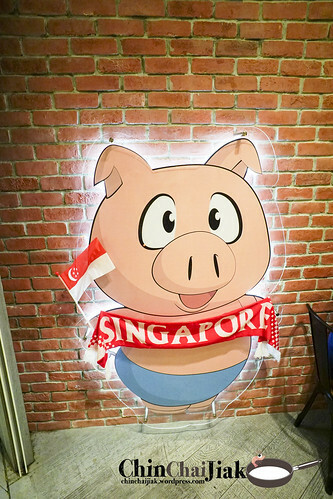 Lastly, I really think that Tai Lei Loi Kei should rethink about their branding because this english name is so difficult to remember (or even pronounce for non cantonese speaking people) and people probably end up calling this place the Macau Pork Chop Bun place at Nex. 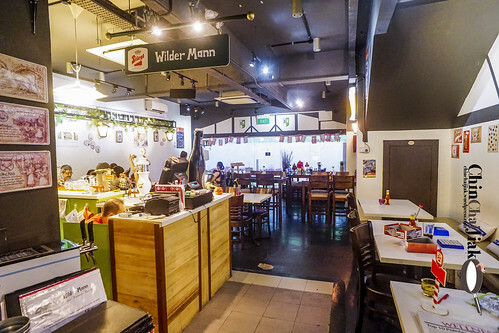 When we think of German food in Singapore, we normally do not associate them to the word “affordable” or “homely” but Wilder Mann is one in a slightly different caliber. 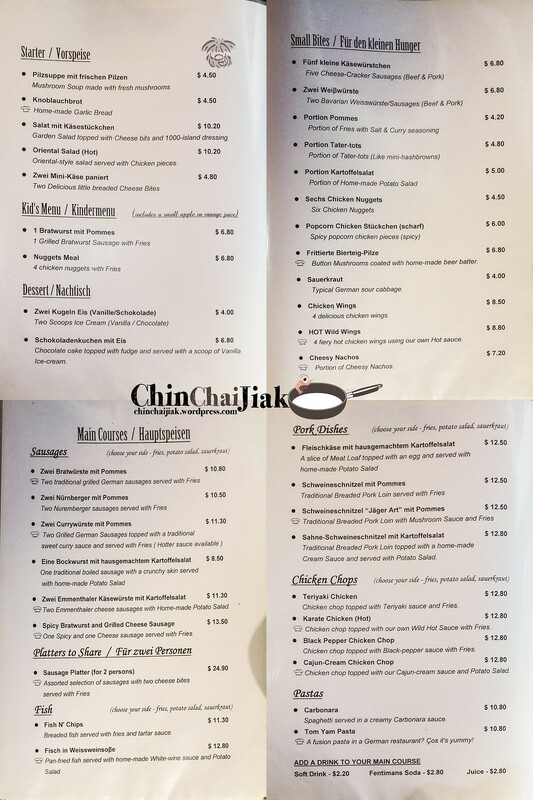 I was quite surprise when I saw their menu, where most of the dishes are like 30% cheaper than the usual German restaurant and they do not charge GST and Service Charge. Wilder Mann also sets a very relaxing mood in the restaurant especially during at night. Wilder Mann is recommended by a friend who lives nearby and since they opened last year in 2014, it had became one of her favourite haunt. 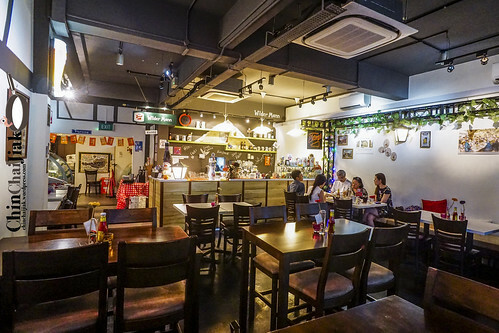 It is a small locally owned business and the boss is a half German half Singaporean who stayed in Singapore all of his life. Having worked in the F&B industries for years, he mentioned that it has always been his dream to open a restaurant serving food the he loved. 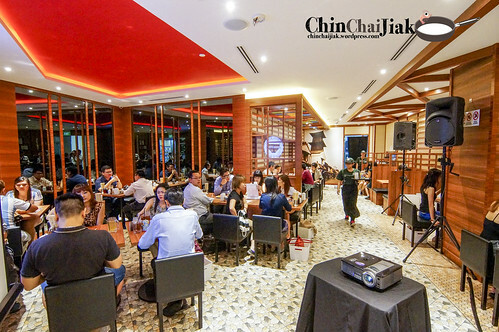 Apart from traditional German food, and after receiving some feedbacks and requests, they also offer a few Singapore-style dishes like the Karate Chicken Chop and Tom Yum Pasta. And of course, don’t forget about the selection of German beer. 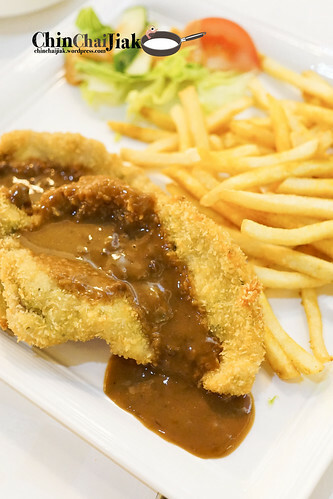 Although this dish is not the most unique, it’s very properly done up as the thinly pounded pork cutlet is well tenderise and flavoured. It has just the right amount of crisp, less the usual greasiness. Their fries are with a good dose of curry powder and this not an adaptation of Singapore flavour, but a way to have your fries in Germany. These fries are really good and I can’t get enough of them. Fleischkäse is a common snack food found in various part in Germany. This loaf of compact pink meat is served in slices and topped with a sunny side up, together with a portion of potato salad and greens. The texture is almost identical to the Spam Luncheon Meat and is very flavorful. The taste is more complicated than our favourite luncheon meat but the one similarity is the salt level. It’s rather salty by itself and I wish I have bread to go with it. I feel that this dish has a lot of potential considering how popular our luncheon meat fries are. Personally, I prefer this as a side dish instead. I was quite looking forward to the Tom Yum pasta actually however it didn’t meet my expectation. The taste of the tom yum sauce is actually quite decent but it’s too watery. 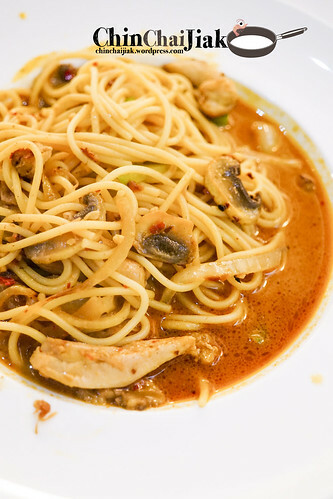 It didn’t manage to cling on to the pasta at all so each mouthful is a pretty bland and i got to drink the sauce like it’s really a bowl of Tom Yum soup and that is a not my definition of a good plate of pasta. This is the most satisfying dish of the day. It comes with a huge portion of side dish of your choice (potato salad, which I forget to take photo), and six pieces of well-sized German Sausages of various flavours. I’m quite sure the portion is more than what two person can finish especially after taking into account of their side dish. The weird thing is they decided to add in two pieces of cheese bites (one piece per person) in the platter. It’s not a matter of taste (in fact this breaded melted cheese taste really good) but like why? And only two pieces? I would pay to have more of these. For this dish, i love it initially, then not so much. 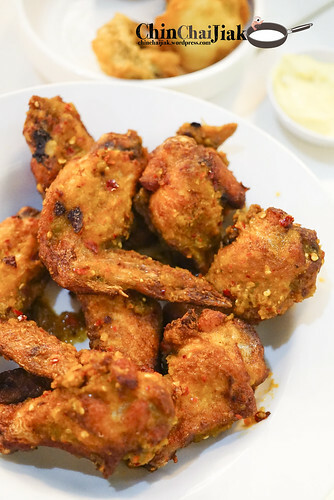 At first bite, the chicken wing is pretty crispy with a zesty spicy punch. However it became soggy after the breading soaked up the chilli sauce. The chicken wings are quite well marinated though so it’s a pity as it started off quite well. I probably should had finished it quickly when it’s served. 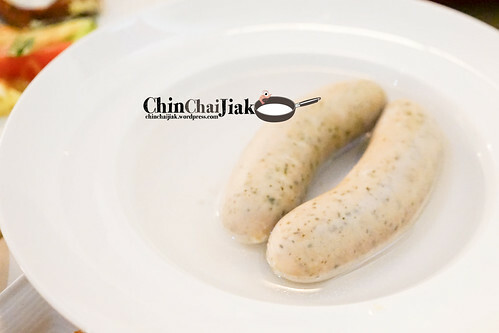 Honestly, this plain looking plate of boiled sausages doesn’t look too exciting at all and I was not expecting a boiled healthy meal whenever someone mentioned “German Food”. This is actually my friend’s favourite dish and she will mostly order this whenever she visits Wilder Mann. The herb fragrance of this sausage is something different from the rest. I really like the dining environment of Wilder Mann. Although there is no exaggerating interior design, it feels very homely and relaxing. It’s somewhere that I want to go if I want to avoid the noisy crowd and yet to have a good meal. Their food are pretty good for some, but there are also a couple of misses. Their dishes are totally not gimmicky and it reminds me a meal of home cooked western food. Given the current dining trend, i feel that Wilder Mann will lose out in term of food presentation and having the “Wow” factor. For example, they decided to present their sausage platter and side dish in separate plates. 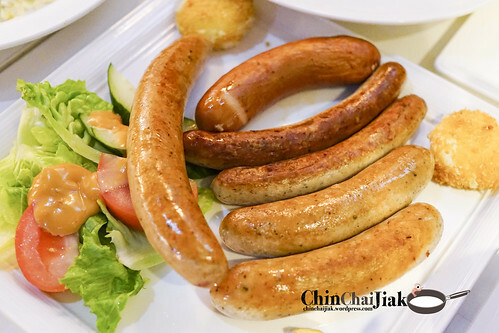 Instead, they can consider slicing some sausages so that it will not look so repetitive, and by serving them on the same plate with a big bed of curry fries which will help in making it looks a little more impressive. 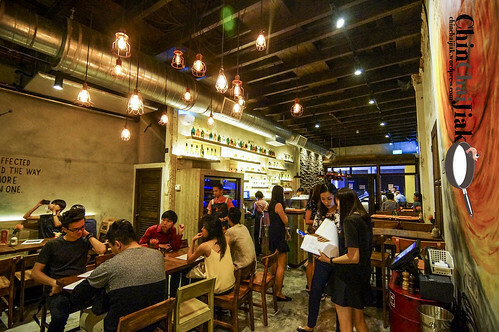 FYR Cycene Ond Drinc, pronounced as “fire, kitchen and drink”, is a new addition to the stretch of bars and restaurants at the Telok Ayer area. Thank you Amanda from Brand Cellar and the folks from FYR for hosting me and the event is absolutely wonderful, with more than ten dishes lined up for tasting. FYR interior design is rather interesting, like an abandoned warehouse being brought back to life at night. Their design are very much focus on wood and earth. 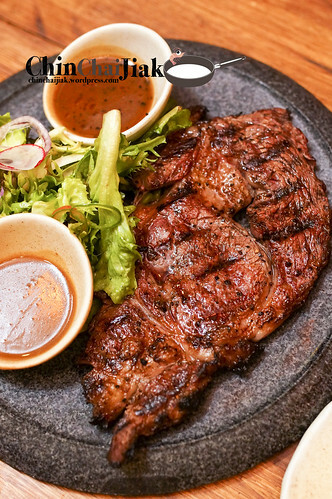 The plating of their grilled dishes are very well thought of. Perhaps the culinary concept of FYR is to bring us back to the stone age when grilling stuff on fire is the primative form of cooking and the way to enjoy food. Even their dishes are presented and served on stone slabs. 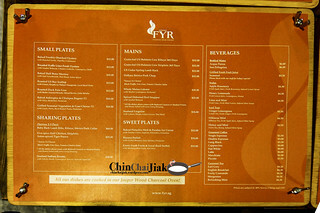 All of FYR dishes are whipped up in Charcoal oven and grilled over Lychee Wood that gives the dishes a pleasant smoky fragrance. Among the dishes that I tried, here is my top three – Ribeye Steak ($32), Lobster ($35) and the Pistachio Lava Cake ($10). I always have a thing for flame grilled steak. When a piece of steak, especially the ribeye cut, is grilled properly over a flame, the usually chewy fatty tissue tends to soften and break down and the end result is a piece of melty tender steak. And this is the case for FYR. 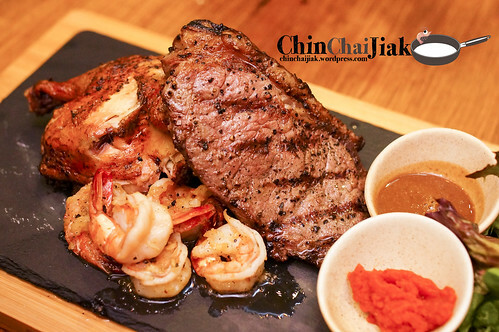 The steak is flavour with salt and pepper and it has a good grilling flavour on the outside and is tender and juicy on the inside. i also got to try both of the sauce – the black truffle sauce and the foie gras sauce. I thought both are pretty good, but I can do without any too because just the steak is good enough. This steak got my favourite vote for the night. At $32.00, i think it’s rather worth the money. It would be perfect if FYR can just throw in a portion of carbo into the steak. FYR is not using frozen, but live lobster for this dish. 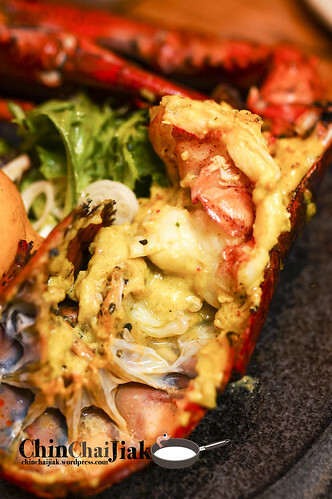 The lobster is too grilled and covered in a thick layer of black-peppery shallot lemongrass bechamel. This buttery milk sauce has a faint lemon grass flavour which doesn’t overpower the natural sweetness of the lobster. Even after extracting the meat from the shell, i was scrapping the sauce just to enjoy it a little more. 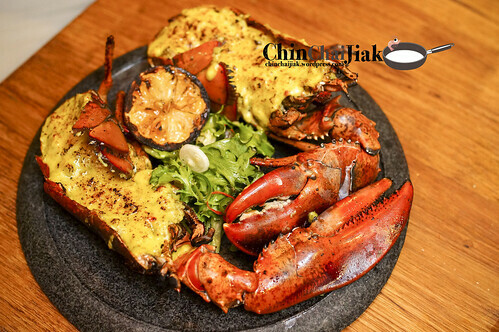 The texture of the lobster is excellent – bouncy and succulent, and I think the grilling plays a very big part in obtaining such a texture. For a guy like me, I think probably this dish can’t fill my tummy but I think it’s pretty good if it’s for sharing. Many recommend this as the must-order dessert after trying it at FYR. It also comes with portion of handmade Pandan Ice-cream which i personally like it. It’s creamy and rich of pandan taste but it’s a tad little overly sweet. If only the sweetness can be reduced a little. 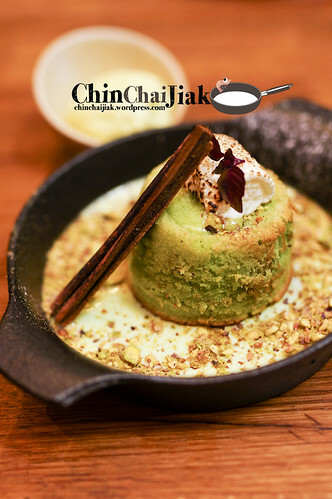 As for the lava cake, the sweet Pistachio fillings is lightly salted and taste like a mix of salted egg yolk custard crossed with molten white chocolate. The cake is excellent when they pair it with crushed Pistachio nuts that’s scattered all over the plate. 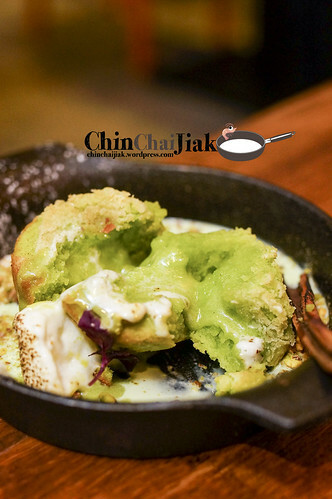 The grilled mush mellow makes the appearance looks absolutely delectable when the melted mush mellow is mixed into the molten Pistachio sauce but to be honest, i think it doesn’t add on to the taste, except by making it unnecessarily sweeter. 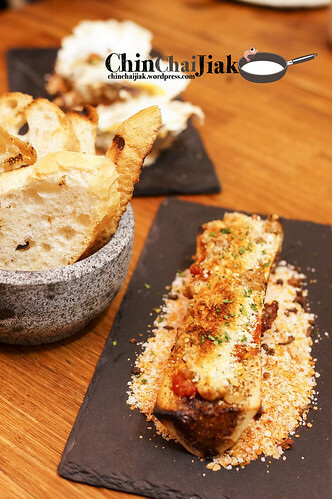 There also another two worthy mention – Baked Bone Marrow ($15) and the Five Spiced Half Chicken ($55 and also comes with a striploin steak and grilled prawn). Honestly this is the first time i tried bone marrow and it is actually great. This is like a less flavoured foie gras but with the same amount of grease and fragrance. Scoop it up, mash it and spread it over the bread, and sprinkle just little bit of sea salt and you are good to go. Apart from the taste, little did we know that it’s actually very nutritious. Google it. 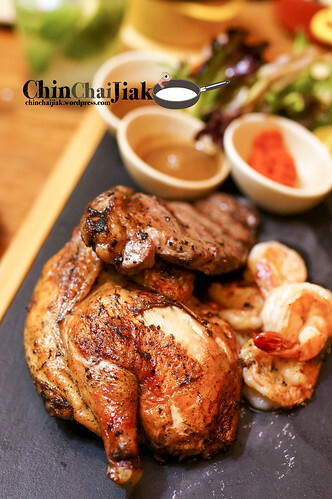 The five spiced grilled chicken, doesn’t go on its own but comes with a portion of striploin and grilled prawn and cost $55. I particularly like the chicken as I am impressed by how evenly the inside of the chicken was cooked using the grilling method and how soft and tender the meat is. The appearance looks pretty ordinary but it’s actually one of the best grilled chicken that that i had. It’s a pity that i can’t order just the chicken alone. Among the dishes that I tried, those mentioned above are the five that I personally like. I had photos of the other dishes after the conclusion, if you are interested. 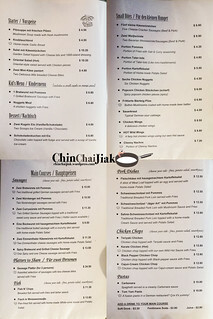 At a glance at the price of their main course, most of them are $30 and above, except for the seafood linguine $18, which i don’t exactly fancy. I wouldn’t use “cheap” to describe the price of main course but you can see that the ingredients used in each dishes are not cheap as well. For the same kind of quality showed in today’s food tasting, I actually don’t mind returning to FYR to pamper myself after a hard day’s work in the CBD area. 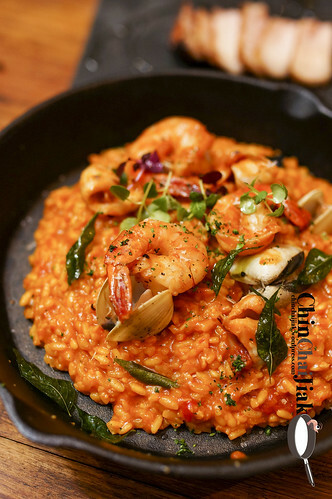 Seafood Saffron Risotto – $48.00. The tomato taste is so much stronger than the lobster broth. Gotta work on it. 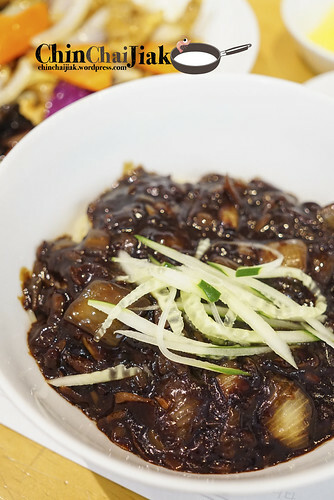 Jajangmyeon, is a Korean dish well known by all. Before my trip to Seoul, little did I know that Jajangmyeon is not readily available in any Korean restaurant but only selling it in Chinese restaurant in Korea. 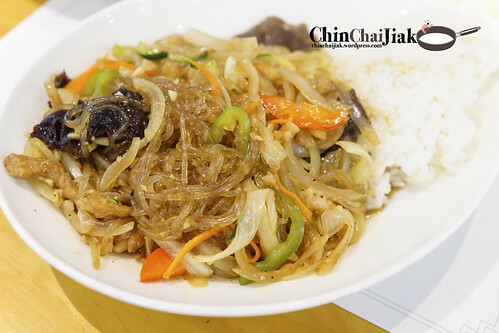 It is kind of a fusion between Chinese and Korean dish. 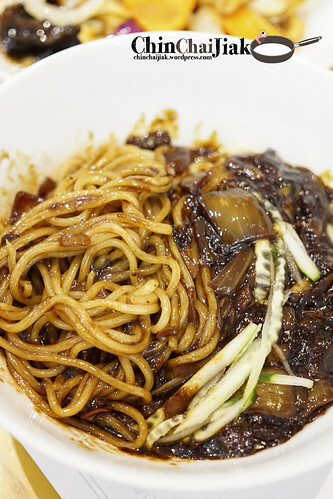 Jajangmyeon is one of the first Korean dishes that i’d known because it’s quite commonly found in Singapore. 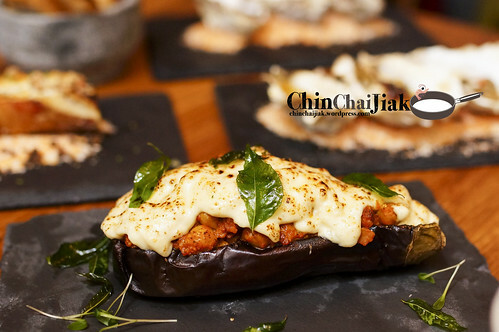 In this post, I’m writing about the best one that I had in Singapore. 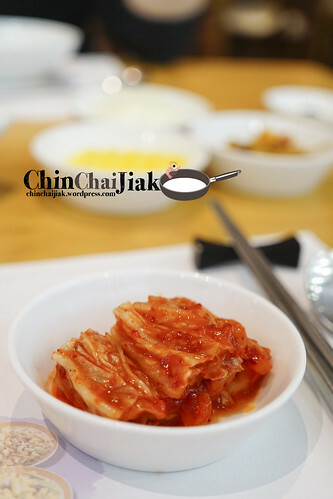 Tae Woo Korean Restaurant is situated at level 3 of The Central Clarke Quay, just above TCC. 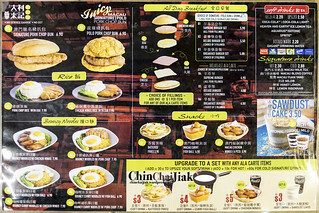 Tae Woo actually has quite a reputation among the Singapore Korean community due to it’s authentic Korean taste. This place is not crowded most of the time, but I’m bound to see Korean speaking patrons whenever I visit this place. There isn’t any hot stone rice, Korean BBQ and there’s also no Army Stew on their menu. 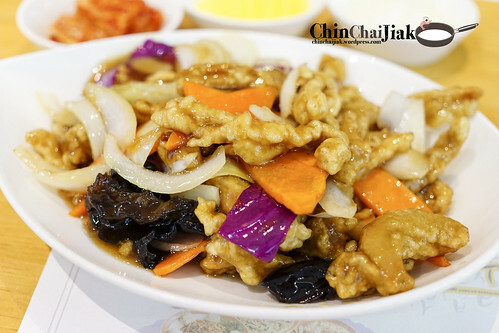 What they are offering are more of a typical Chinese Korean menu like Jajangmyeon, Seafood Noodle (Jjamppong), Sweet and Sour Pork (Tangsuyuk) and Gyoja. 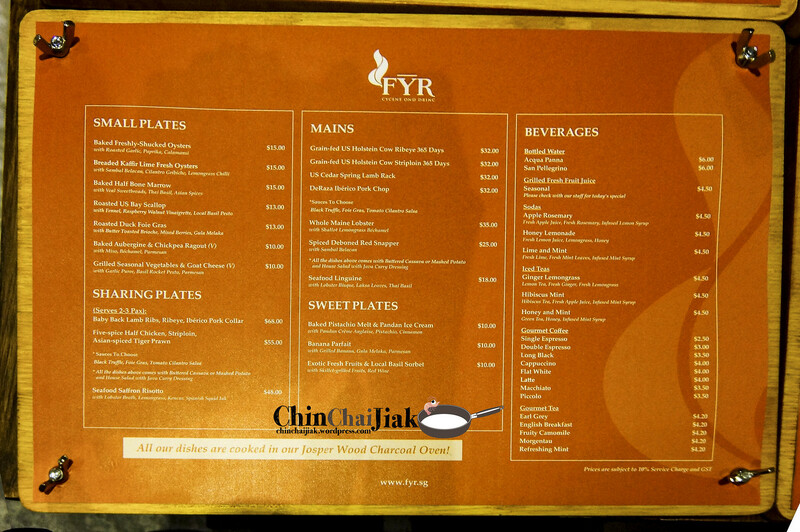 At a glance of the menu, i wouldn’t use the word affordable to describe the price tag of the dishes. Among them, their Jajangmyeon should be the most reasonably priced and sometimes I will visit Taewoo just for that when I’m having craving for some authentic Korean Jajangmyeon. Taewoo is a hidden gem at The Central and there’s not much crowd here and I like the fact that i can always get a table immediately. I wouldn’t recommend to start a feast at Taewoo as it might cost you a bomb. 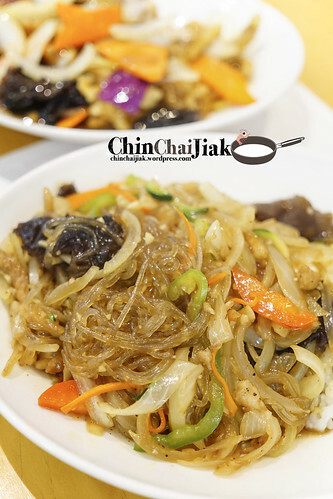 I do recommend their Jajangmyeon very much, and probably try out the other dishes, one new dish per visit. 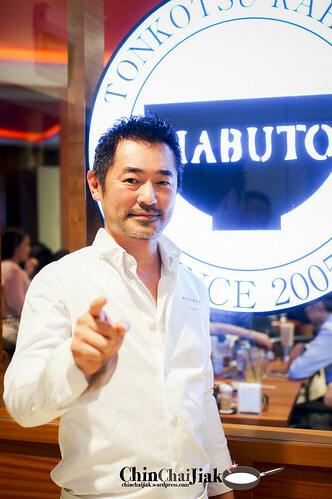 First of all, thank you Chabuton Singapore and Natasha from Brand Cellar for the invite to the media launch preview of Chabuton’s seasonal ramen, The Kurobuta Ramen. 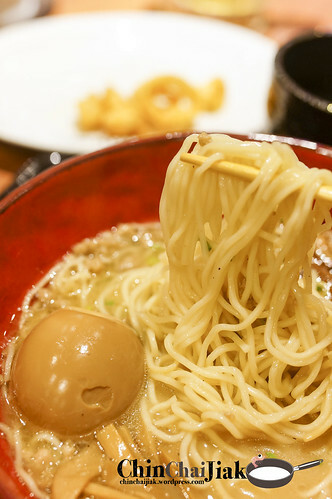 The recipe of this ramen is specially created by Michelin Chef Yasuji Morizumi to cater to the taste of Singaporean and of course, it’s only available in Singapore. This creation features a blend of Tonkotsu and Chicken Collagen Broth that comes with a piece of highly prized Kurobuta Pork. 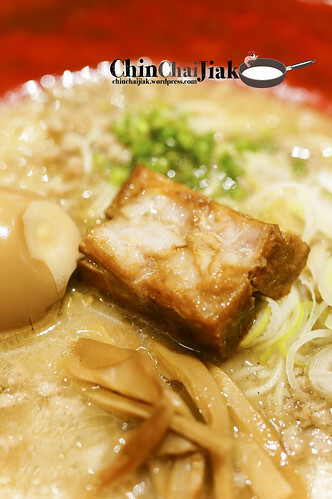 This seasonal ramen is available from now till the end of March at all Chabuton outlets. Firstly I will write about the broth. It’s a pretty interesting blend of chicken and pork broth and i must mention that this is a really strong broth. It’s not only thick and creamy, it’s also bursting with flavours. Interestingly, this is the first time i had a broth with a rather solid ginger after taste. A friend of mine who loves ginger adores this broth very much but I’m not sure if I can say the same thing for people who don’t take ginger very well. Personally, I like the broth but hope that the ginger taste can be more subtle. 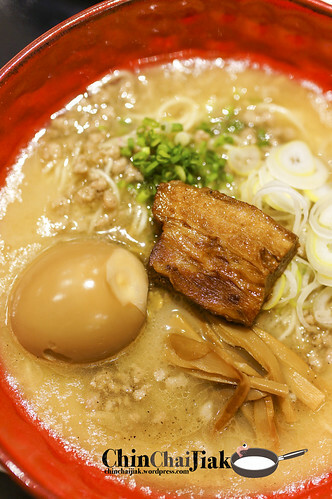 Among of the whole bowl of ramen, my favourite is the piece of tender Kurobuta Pork. This piece of meat is interlaced with thin layer of fats and although it doesn’t has the melt in your mouth texture, i think it’s still pretty good for it’s sweet succulent texture. Although it’s mentioned that this ramen is catered to Singaporean’s taste, i am quite surprise that the noodle is lightly boiled. For me, I rather fancy ramen that is a little firmer. I like the chewy texture and has something to bite on, but I thought generally Singaporeans like their ramen a bit softer. And the restaurant manager replied that we can actually choose the firmness of the noodle upon ordering, which is good. This creation by Chef Yasuji Morizumi is rather interesting and it doesn’t taste like any other ramen that i had tried before. The taste of this ramen is quite refreshing but I thought there’s actually some risks involved due to its unconventional flavour. 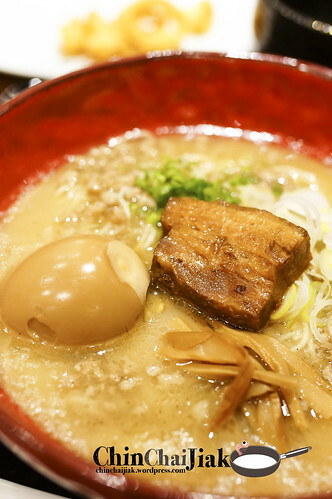 If you adore ginger and strong ramen broth, this may just be the ramen for you. As for it’s pricing, i thought at $18.90++, this luxurious version is facing stiff competition from other cheaper alternatives that are just as good. However, i have to give points this ramen for it’s ability to capture people’s attention with it’s alluring ingredients like “collagen” and “kurobuta pork”. 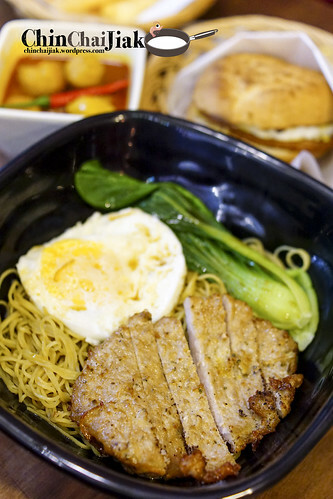 This ramen seems like just the perfect menu to attract our Singaporeans that love new and interesting creations.